Galaxy S9 Easily Passes JerryRigEverything's Durability Tests - AndroGuider | One Stop For The Techy You! JerryRigEverything aka Zack is well known for putting flagship smartphones through his series of durability tests which include scratching, burning and bending. The scratch test revealed that the Galaxy S9's Gorilla Glass 5 backed display is tough as any other flagship device (say the iPhone X or Pixel 2). It was the burn test which yielded surprising results. When Zack put his lighter's flame on the screen, the pixels turned white after a span of twelve seconds. Unlike other AMOLED displays however, the pixels did recover to their original form even though the oleophobic coating covering the glass was compromised. The scratch test revealed that the sides and buttons of the S9 are made of metal. Samsung has said that a superior quality of aluminium has been used for the S9 than its predecessor. Zack believes that the better quality of aluminium along with the extra layer of glass (the S9's front and back glass are thicker than its predecessor) will make the S9 more "scratch and impact resistant." The upgraded aluminium frame did help the S9 during the bend test. When the phone was bent from the either side, there was a slight flex, but the glass didn't separate from the frame, and the IP68 rating of the phone hence remain intact. 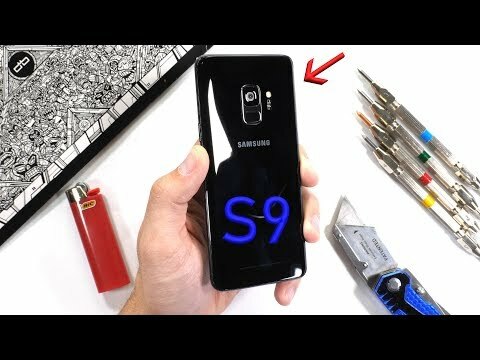 The replaced fingerprint scanner on the S9 worked flawlessly even after it was mercilessly abused by JerryRigEverything's blade (oh Zack, what did these poor little things ever do to you?). The Galaxy S9 thereby successfully passed JerryRigEverything's durability test.